Well what an eventful couple of days. I brought Dan the Banner into Boston for a couple of days, and I would have to qualify it as a successful trip. Truth be told, we didn't get to go everywhere I would have liked in the short time, but Dan the Banner and I got to visit Fenway Park, TD Garden, Old North Church and Paul Revere's house. I had originally wanted to also go to Boston Common, the USS Constitution, and get some pictures around Fanueil Hall, but unfortunately some unforeseen circumstances cut my trip to the city short. But the pictures I was able to get with the Banner were fantastic, we had a great time, Dan even almost got mauled by the Bruins bear at the Garden! But I saved him. Great trip, will have to go back at some point to get some more pictures in the city, can't wait for the next adventure! Dan meets Olympic Gold Medalist Jennie Finch! So I am a few days behind on this, but Dan the Banner had a great start to the month of September when I was fortunate enough to meet softball superstar, former member of Team USA, and Olympic Gold Medalist Jennie Finch! Jennie was making an appearance at the Brockton Rox game Saturday night, and thanks to the very nice people at On Deck Sports, I was able to get a couple of VIP tickets to the game, BBQ and autograph session. I wasn't entirely positive that my Dan the Banner picture mission would be a success since it was more of an autograph session than photo session, but nevertheless I was going to give it my best shot. I maneuvered myself to the back of the line - a few times actually - and of course laughed at the fateful moment that I revealed the giant banner standing in line and received a number of bizarre looks from the surrounding crowd. When it was my turn I approached the front of the line, said hello, and explained the purpose of Dan the Banner to Jennie, who while at first was entertainingly confused by the banner, said she absolutely would take a picture with Dan and was honored to do so. She asked if she could write him a note on the banner, I of course said yes - I mean, she's Jennie Finch, she can do whatever she wants - then took a picture. Added bonus: was able to catch the whole encounter on video, which is the first video documentation of a Dan the Banner encounter. Being a HUGE Jennie Finch fan, I am so happy about this particular success. Very memorable day, hoping for more to come with the Banner! Been a little while since I've filled you in on Dan the Banner's adventures - my apologies - and there are things to share. Last week Dan went on a wonderful tour of Wrentham & Plainville, with a pit stop in Cumberland for some ice cream. Dan had a blast, and got some great pictures around town. Later in the week, Dan stopped by the movies for a double feature. First, we saw The Smurfs movie (which was very cute), and then after that we saw Rise of the Planet of the Apes. I actually really liked it, James Franco was really good and it wasn't as much of an injustice to the classic (even though it is a prequel and not a remake) as some movies are these days. The only (minor) problem I had with it was when they forced in the "Get your paws off me you damn dirty apes" line from the original that 1) was clearly forced in, 2) was said by the character in the movie that was already annoying, and 3) did absolutely no justice whatsoever to Charlton Heston's delivery in the original. But again, minor flaw and other than that I was really impressed. But the latest (and greatest?) adventure for Dan was his return to training camp this afternoon. Unfortunately it's been a hectic schedule, so this was only Dan's second appearance of camp. And a rain shower came perfectly at the end of practice so Dan only came out for a minute (which was really unfortunate as it would have been a huge day, but instead I missed out on Deion Branch, Brian Hoyer, and Zoltan Mesko.) Fortunately though, the shutout was avoided. The rain cleared up just enough for me to set Dan up in time to get a picture with rookie QB Ryan Mallett, which was a huge success. Will be interesting to see where Mallett ends up career-wise since his path in New England is surely blocked in the near future by Brady, but he's a huge talent and so this was a huge success. Wow, what a busy day for Dan the Banner. To start out the morning, Dan the Banner the tour of towns began in Mansfield. Considering it is the hometown and where we grew up, I found it only fitting to start here in the travels of the banner. We visited all kinds of places, and Danny had a ball. Unfortunately, it was a little early in the morning and a Saturday, so we didn't get to meet anybody around town, but got some great pics. Being the hometown and all, there may be a Day 2 of travels and pics, still a couple of places around town I need to hit up and get a picture. But it was off a great day in the good ol town of Mansfield. Dan down at the Little League Complex, where many a nights were spent growing up. As if that wasn't enough, later in the day I hit up Training Camp for the first time in 2011. It was a little slow, not too many people signing autographs in my section (and to be honest, it usually takes me a couple days to get warmed up and start calling people over), but fortunately Day 1 was not a shutout. Dan met Pats WR/Returner Julian Edelman. He seemed really nice, was very talkative with the fans, which was cool. Not the greatest of pictures, Dan's slouching pretty significantly, but Edelman is still rocking the caveman look so that made the picture look great. ﻿ Probably won't be able to get back to a camp for a couple of days, but definitely excited to be back in this time of year. The Ocho-watch is officially on, as he has become my #1 Dan the Banner goal for this year. Dan visits The Hall at Patriot Place! After a long time basically hibernating over the last couple of months, Dan the Banner is back and better than ever. A thought dawned on me recently, as I realized that having Dan the Banner just hanging around doing nothing is really an injustice. I mean, he wants to get out and about. So I am onto a new endeavor - Dan the Banner is busting out, and busting out in a big way. While Danny is on deployment in Afghanistan, I feel it is my duty to make sure Dan the Banner hits the town and has some fun. And that's just what we are going to do over the next few months - go anywhere and everywhere. Dan at The Hall with AFC Championship trophies. Dan after he kicked a field goal, in the snow. It was good, of course. As I said, Dan the Banner is going to be hitting the town over the next few months and hitting the town hard. So be on the lookout because it's going to be fun and something to see. And more importantly, if you have any places he should visit, be sure to share, always up for new adventures! Dan the Banner meets Devin McCourty! Oh what a day, what a day, what a day. Welcome in 2011 for the Banner! Tonight Dan made his first friend of the year, and oh was it a good one! The one and only Pro Bowl Selection, 2nd Team All-Pro, Should've Been Defensive Rookie of the Year, absolute stud in the making, Patriots CB Devin McCourty. And while I feel like I say this a lot, this truly was one of my favorite experiences because 1) I LOVE Devin McCourty and cannot wait to see him dominating in the Patriots secondary for years to come (what can I say, I have a soft spot for defensive backs), and 2) he said, and I quote, that Dan the Banner "might be the coolest thing I've ever seen." Come on! I loved McCourty already, love him even more now, I think he may have just jumped up to my favorite Patriot because of that quote. Devin made a Speaker Series appearance tonight at the Patriots Hall of Fame, I was fortunate enough to go, had the Banner in tow (obviously), and was able to get my pic with Devin, which I was so excited about because he was one of my targets at Training Camp this summer and I unfortunately never got the chance to get his pic. The event was really cool, basically a simple Q&A session with McCourty, and he was really good; very interesting, funny, informative, and it was really cool to listen to him talk in such an intimate setting. First adventure for Dan the Banner in 2011 after coming out of winter hibernation, and it's certainly kicking off an a high note. So excited for this one, I think Dan the Banner has a new fan, a new friend, and a new favorite Patriot! This guy is a stud in the making, one of the very bright spots on the Patriots young defense, and he's going to be a GREAT player in this league for years to come, so this is a huge addition to the Banner collection. FOD: Big Night for Lady A at the Grammy's! I know, I know, I'm long overdue for a Dan the Banner update. So first, Happy (very belated) 2011! I'm feeling a big year for the banner, hopefully it turns out to be one! Have a few updates from some of Dan's friends who have started the New Year out with a bang. FOD Lady Antebellum took home 5 Grammy Awards last night. Big new of the day is a HUGE congratulations for Lady Antebellum, who saw the culmination of an enormous breakout year end with a huge night at last night's Grammy Awards in LA. Lady A entered the show with 6 nominations and Hillary, Charles, and Dave walked out stars of the night, not only performing on the big stage (for the second year in a row), but rounding up 5 awards - Best Country Performance by a Duo or Group, Best Country Song, Best Country Album, and 2 of the nights biggest awards, Record of the Year and Song of the Year. What a night! I'm so happy for the trio, and while all the awards and accolades are certainly deserved, I'd like to think meeting Dan the Banner a couple of months ago propelled them to the next level and helped them win their 5 trophies last night. Ok, perhaps that's wishful thinking on my part, but it certainly is a great start to 2011 for Dan the Banner. Congrats Lady A! I hope 2011 is even bigger for you than 2010! 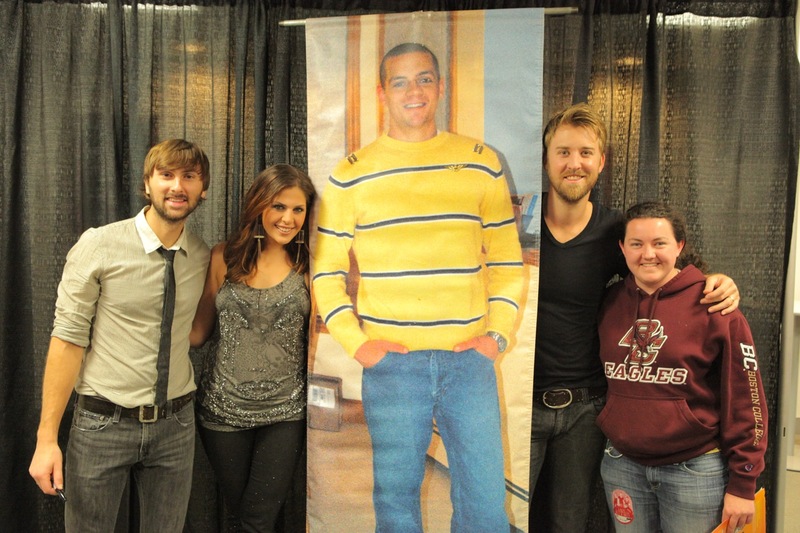 Check out this article here to recap Lady A's banner night and all the rest of the fun from last night's award show. In other Friends of Dan updates, a belated congratulations to Pats QB Tom Brady for the numerous honors he's won since the end of the football season. Ok, yes, I am as bitter as anyone about the abrupt end to the Pats season (seriously? You lost to the Jets at home? Really? ), but Tom had a fantastic season, culminating with a unanimous MVP award, the first in NFL history. The MVP was the icing on the cake of a season that saw Tom finish with 36 TDs to only 4 INTs, and the 5th highest passer rating for a season ever. So congrats on the award Tom! As well as the AP Offensive Player of the Year, 1st Team All-Pro, and Starting QB at the 2010 Pro Bowl (even though he missed the game because of injury). With pitchers and catchers reporting yesterday (finally! ), day 2 of the 2011 baseball season is under way, and what a wonderful feeling it is! Lots to look forward to in 2011 for the boys of Boston, can't wait for the season to start! Beanpot Championship tonight on NESN (7pm) as BC takes on Northeastern in search of back to back titles. Check it out! Normally you wouldn't expect Lady Antebellum and Tom Brady to be mentioned in the same blog post, but that is the wonder of Dan the Banner, bringing together people of all walks of life. Stay tuned til tomorrow, the Banner is coming out of it's winter hibernation and is ready to rock 2011! Dan the Banner meets Lady Antebellum!